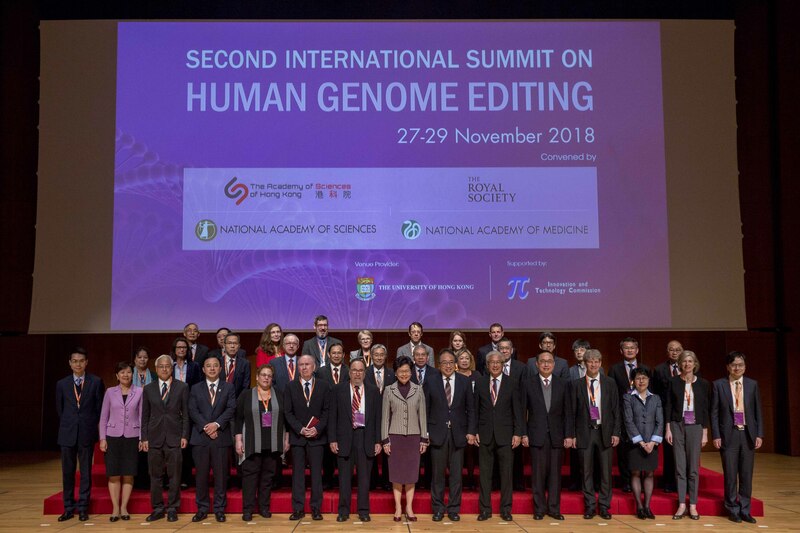 Conference Kick-Off: Chief Executive of the Hong Kong Special Administrative Region, Mrs Carrie Lam (front row, center), flanked by co-organizers David Baltimore (left) and Lap-Chee Tsui, signal the launch of the Second International Human Genome Editing Summit. 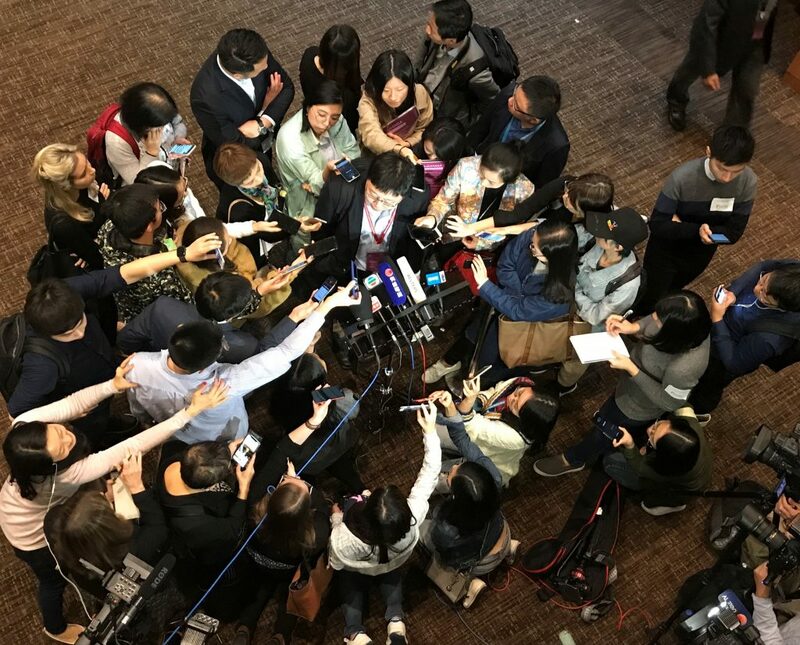 HONG KONG — Under intense scrutiny of the global scientific and even mainstream media, the opening session of the second international Human Genome Editing Summit in Hong Kong took place almost as if nothing sensational had happened. 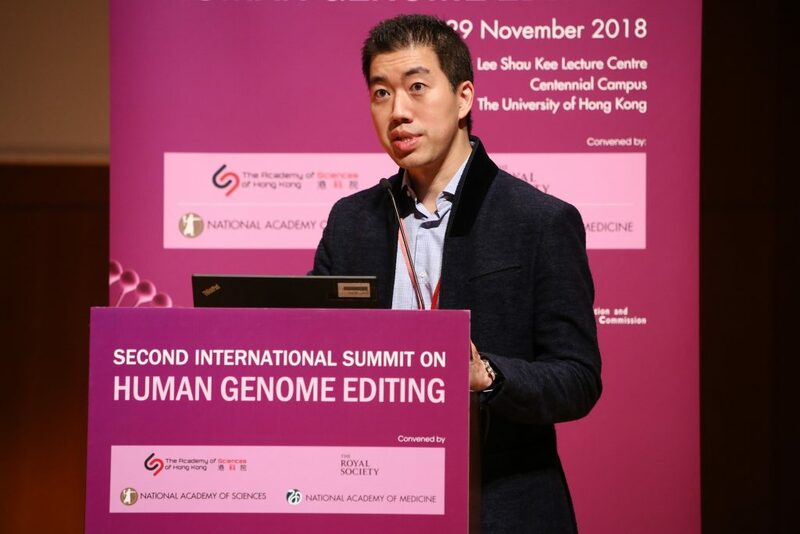 Just 48 hours before the start of the conference, reports surfaced that a group based in Shenzhen, just across the Hong Kong border with mainland China, had performed genome editing on human embryos using CRISPR-Cas9. The leader of that group, He Jiankui of Southern University of Science and Technology in Shenzhen, is due to speak at the conference on day two, although summit organizers could not confirm his attendance. Following a report over the weekend in Technology Review, the Associated Press published a lengthy article on the Chinese research study, including the news that one woman was pregnant. He later claimed the birth of twins who underwent germline editing with the uncorroborated aim of disrupting the gene for CCR5, a well-documented cellular receptor for HIV. The goal was to prevent transmission of HIV to the baby. Baltimore said the community “must continue to revisit questions” raised at the inaugural genome editing summit in 2015. When will it be justifiable to employ genome editing for therapeutic uses? And under what circumstances can we be prepared to use genome editing for purposes other than for curing disease and alleviating disability? It wasn’t until the ceremonial speeches and obligatory conference organizer team photo were completed that the conference finally launched. 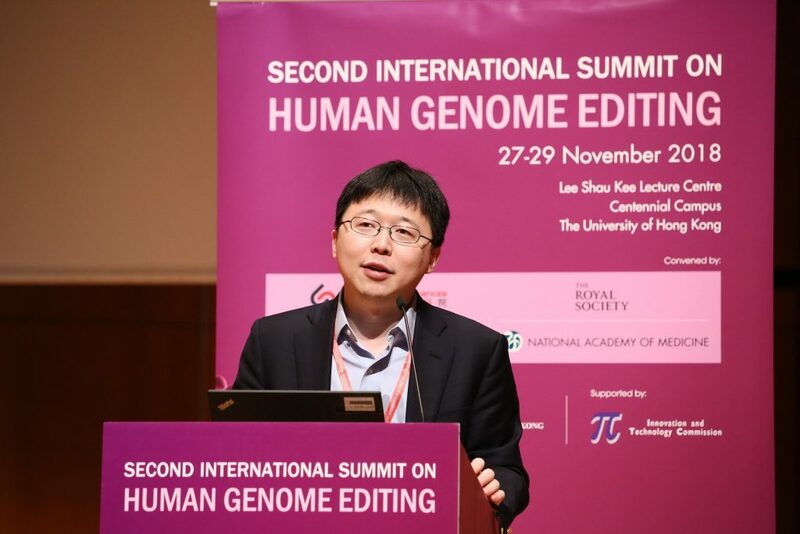 Qui Renzong, a bioethicist from the Chinese Academy of Social Sciences, sharply criticized his compatriot He Jiankui, questioning various aspects of the CRISPR twins report including the approval status of the Institutional Review Board, the possible violation of Chinese Ministry of Health regulations, and the absence of any direct discussion between He and the broader genome editing community. 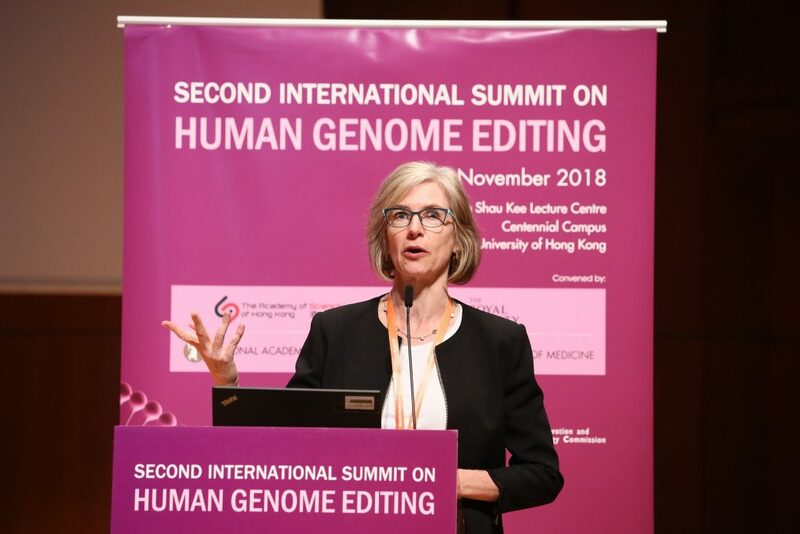 Dana Carroll, a genome editing pioneer from the University of Utah, noted that CRISPR and two other genome editing technologies (ZFNs and TALENs) are being deployed in a variety of preclinical settings, including blood disorders, AIDS, immunotherapy, and various Mendelian disorders. However, “full realization [of the potential of CRISPR genome editing] will require greater control of the cellular [process] of genome editing than we currently possess,” Carroll said. An example is gene replacement for cystic fibrosis, the molecular basis of which was uncovered 29 years ago (by summit co-host Lap-Chee Tsui). The target tissue (lung) is relatively accessible, but the affected cells are deep in the lung; meanwhile many patients lose pancreatic function. Carroll also brought up the thorny issue of equitable access to therapy: How will genome editing benefits be made readily available around the world? Most patients affected by sickle-cell anemia or thalassemia live in Africa and Asia. “It is inconceivable that expensive, complex therapies could be made broadly available in high-risk areas. I don’t have any bright ideas on how to achieve this,” said Carroll. In the afternoon session, genome editing luminaries Feng Zhang, David Liu (both of the Howard Hughes Medical Institute [HHMI]/Broad Institute) and Jennifer Doudna (HHMI/UC Berkeley) gave short presentations summarizing new advances, including base editing and the development of new Cas enzymes that might complement the CRISPR toolbox. Liu summarized exciting progress over the past few years in base editing, which uses some of the CRISPR machinery to finesse specific base substitutions into genes of interest. Liu said he was “pleasantly surprised” by results from a base editing pilot study attempting to treat a mouse model of progeria, a premature aging disorder caused by a point mutation in the Lamin A gene. Using two adeno-associated viruses (AAVs) to deliver the base-editing machinery, Liu reported up to 60 percent editing of the pathogenic gene variant in the liver, and a corresponding uptick in expression of the corrected RNA and protein. In a panel discussion, the scientists discussed a range of technical issues that will need to be addressed for successful genome editing, including immune resistance to Cas9 in some individuals and off-target effects. “Most CRISPR enzymes come from pathogenic bacteria we’ve been exposed to and we have pre-existing antibodies,” Doudna said. “That creates a potential problem in a clinical setting.” She said one approach to sidestepping immunity concerns was to investigate Cas enzymes from non-pathogenic bacteria. “I’ve had parents of children tell me that they’d gladly trade cancer for Rett syndrome, or Dravet syndrome, or progeria,” Liu said. The final audience question of the day concerned rogue do-it-yourself scientists. How do we stop “crazy rich people like Elon Musk” designing “super people” for private purposes, one attendee asked? We will see if answers to that question, and many others, emerge over the next two days.